Dog Hyperactivity: so that cute bundle of joy that gazed at you with languishing eyes, pleading you to be adopted has turned out being an out of control rascal once in your home. While this rescue dog surely exhibits quite some fresh zest for life, this situation has left you quite baffled as you wonder how to cope with this very much unforeseen situation. Dogs are just as people, there are those that are the canine equivalent of passive couch potatoes, and there are those that simply can’t stay a day without a workout. Breed and temperament do seem to play a major role. So any time you foster, rescue or adopt a new dog, make sure you do your research and investigate on the dog’s breed requisites and overall temperament. Generally speaking, breeds like Dalmatians, Jack Russells, Border Collies, Huskies and Retrievers are defined as high energy dogs. Many have a history of having been working breeds that had an every day task to keep their bodies conditioned and their minds animated..
An energetic dog is simply a dog with a high demand for activity. They may require more exercise than other dogs, as well as mental stimulation. In order to keep energetic dogs calm and well behaved, you will need to dedicate time and energy to meet this dog’s physical and mental demands. All dogs really need exercise, however, it is the level of exercise needed that makes the big difference. For a Chihuahua for instance, prancing around your living room all evening may meet its physical needs, while a Labrador may need much, much more. Owners often dismiss the fact that each dog breed was developed for a purpose: serving humans in their work. Historically, dogs in the wild used to move along with their pack for hours and days simply tracking down smells and darting at high speed after prey. Movement was the key for their survival so this basic need is innate, deep down in their genes. Later on through history, these same dogs were therefore used by humans for hunting game or herding sheep. These dogs spent the entire day working and then spent the remaining evening in their homes with their master. Domestication has caused dogs to become housebound, bored and lazy. Many dogs are obese because the input of food exceeds their output of energy. Some develop behavior problems because their life lacks that necessary incitement to keep them entertained. Restrain these high powered dogs from exercise, and they will bring to light their own creative ways to keep themselves entertained, this may transpire by gnawing through your drywall or by lacerating your whole drapery apart. Two daily walks per day are better than one big one. Your dog will feel more exhausted after going out twice a day. Try a fast paced brisk walk, your dog should return home panting slightly and thirsty. This is a good sign your dog has had a good work out. A dog back pack may turn the daily walks into a great workout for your dog. Simply adding some weights to the back pack may be sufficient to get your dog burned out. For instance, a thirty minute walk with a back pack may be the equivalent of a 45 minute walk without one. Start out by putting up to 5% of your dog’s weight in the first weeks, increasing the workload up to 15% once the dog is accustomed. Do not however, exceed 15% to prevent potential back strain. Enroll your dog in agility courses. These can turn out being really fun and entertaining for both dog and owner. Agility classes consist of dogs running, jumping over obstacles, climbing and crawling. Dogs surely have a blast from these performances. Many dogs even turn out to be gifted and compete at national levels. 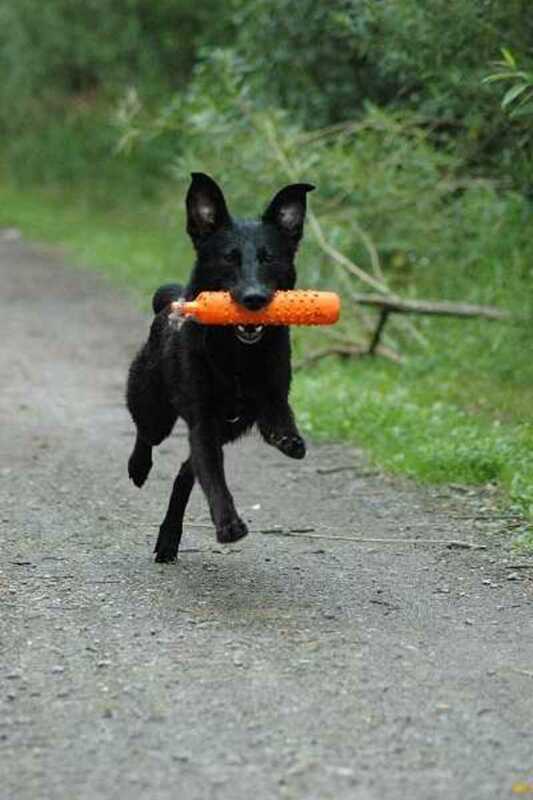 Many energetic dogs have a very high prey drive. These are dogs that have an inherited need to chase anything moving fast. While in the wild the focus of their attention was prey, nowadays, you can release their energy by letting them chase balls or a frisbee to allow them to release the excess pent up energy. Allowing your dog to play with other dogs may be another great and fun way for your dog to burn out that residue energy. Of course, ensure your dog is compatible with the other dogs to avoid unnecessary, risky fights. Organize such play dates in a big yard so the dogs have plenty of room to run about. Many dogs love water and are eager to jump into pools. Swimming is a great opportunity for your dog to release energy while enduring in vigourous physical exercise. Please keep in mind though that swimming may not be suitable for all dogs. Consult with a vet if your dog is still developing or if it is in its senior years. If running with your dog gets you tired or you simply are not that great of an athlete, consider buying a bike and letting your dog follow you. Your dog will surely get quite a workout while you pedal along the street. A halter in this case is preferred since a collar may cause injury should your dog suddenly stop. An energetic dog may mean two things to an owner: either a wonderful opportunity for a healthy lifestyle or an every day hassle to halt the exuberance. It all really depends on which attitiutude best reflects the owner’s personality. In any case, the outcome of an energetic dog relies entirely on the owner being able to handle such a dog, rather than the dog itself. Energetic dogs have no fault for what they are, rather, ultimately they are great specimens of what we humans have bred them for: to be excellent working dogs that perform their job well.